Indestructibles baby books: How Indestructible are they? My baby girl loves books. She loves looking at the pictures, ripping the pages, biting the edges, and throwing them across the room. This isn’t such a big deal when it’s her own baby books, but when it comes to her brother’s books, or worse, library books, it doesn’t end well. Even the official baby books – the board books – aren’t that difficult to destroy (and they really, really hurt when someone smacks you with them. Besides, for some bizarre reason, my adorable baby thinks the rippable books are far better to read (and destroy) than the board books. So, when I spotted the Indestructibles books, it sounded like such an obvious thing. A baby book that babies can ‘read’ – and by read I mean: chew, rip, tear, and otherwise play – without actually destroying it. Hallelujah! My second thought was: just how Indestructible are these books? First, I tried reading to my munchkin. We tried out ‘Love you, Baby’ and ‘Beach Baby’. My baby actively points to the books and when I ask if that’s the book she wants to read, she makes an adorable hissing sound ‘Essss’ for Yes (I’m still geeking out that she can say yes). Within a few pages of reading the baby books, she wants to take over. She starts babbling at the books, and then trying to tear the pages out (so far, unsuccessfully). I was curious just how Indestructible these baby books really are – so I enlisted the help of her big brother. In a typical 4-year-old fashion: surprisingly strong with unlimited energy (especially at bedtime). Her brother was unable to rip the pages. So then I gave it a shot: no luck in making a rip or tear in the baby books. Now, I have considered whether the husband could succeed. He was in the army and has some leftover muscle, but that’s not the point. These baby books are indestructible against babies, toddlers, kids and this mom, so it doesn’t matter if a stronger adult could damage them or not. I was seriously paranoid about turning on the kitchen sink and watching water pour onto a book. It took me a couple minutes – cringing the entire time – and then once I finally did turn the water on the book, I dropped the book into a sink full of dirty dishes. Thankfully, once I rescued the book, washed the milk and pizza stains off it, and dried it, the Indestructibles baby book was as good as new. I did notice that after a few weeks in my house (and my 4-year-old trying to bend the book), there’s some slight creasing lines on the baby books. But, compared to the library books that I’ve had to pay for after a dog has chewed them, or the books I’ve carefully repaired with tape and glue, these are amazing. 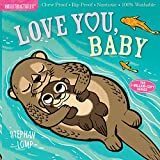 The stories are simple, but for babies (and toddlers really) with short attention spans, this is a good length for a book. As an added bonus, typically when you find a high quality baby book, they’re ridiculously expensive. But with these books, they’re cheaper than the typical board book (and much less heavy when dropped on your foot). Great baby books that are just as Indestructible as advertised. I washed the Indestructibles books with water, tried pulling and tearing it myself, and let my baby girl and her 4-year-old brother try to destroy it for weeks without any success. And because I liked it so much, I bought some for my friend’s baby on his 1st birthday. That’s the highest compliment I can give to these baby books.